Lamington National Park is a jewel in the crown of rainforest bushwalking destinations in Queensland. 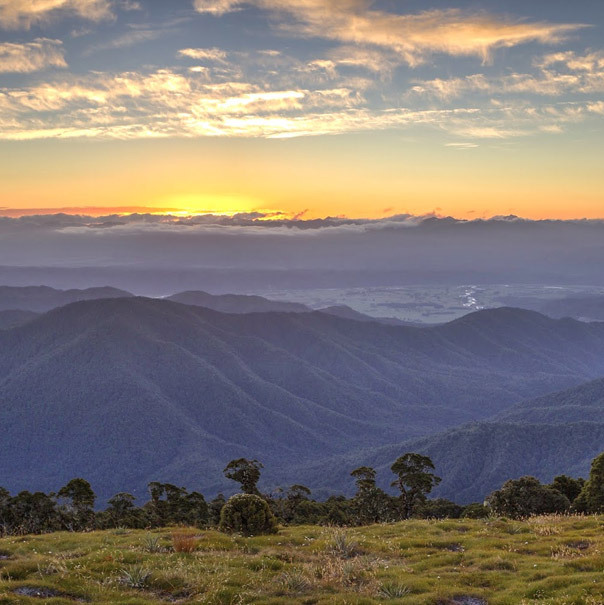 It contains over 320 kms of walking tracks that lead to spectacular lookouts, waterfalls and some of Queensland’s most significant wilderness areas. This track connects the Binna Burra and Green Mountains sections of Lamington National Park. We provide regular bus transfers ($33 per adult) from O’Reilly’s to Binna Burra so you walk the 21.4km track back to O’Reilly’s at your own pace (self-guided). Visit the National Parks website for track information. Learn as you walk on a private guided walk (with or without transfers) with an experienced and knowledgeable O’Reilly’s guide. Additional guests are charged and extra $10.00 per person per hour. Please contact reservations on 1800 688 722 for more information on private guiding or Binna Burra Transfers. Lamington National Park is nearly 1000 metres above sea level which means not only that the temperature is 5-8 degrees cooler than Brisbane or the Gold Coast, but that the weather is changeable. So no matter what time of year you visit, pack a jumper and some wet weather gear. When the south-east wind blows, shower activity increases as you approach the crest of the McPherson Range and decreases to the north of O’Reilly’s. The accompanying low cloud blocks out the view on top of the range making the border walks less attractive under these conditions. The higher elevation here means lower temperatures, so take something warm to wear. Summer rains bring leeches. It is wise to take some repellent with you. Lamington National Park is attracting an increasing number of people each year and the parks continued well being is dependent on the goodwill of the people who visit them. 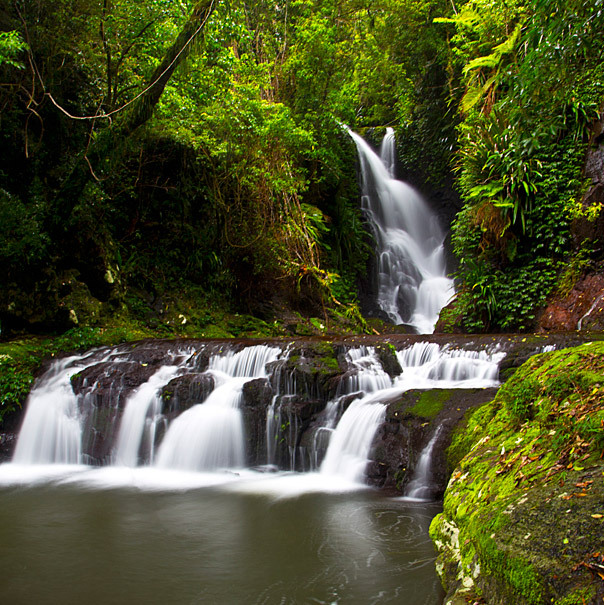 Lamington National Park is made up of two sections: Green Mountains and Binna Burra. Green Mountains section is located on the western side of the Lamington Plateau, and wraps around O’Reilly’s Rainforest Retreat. 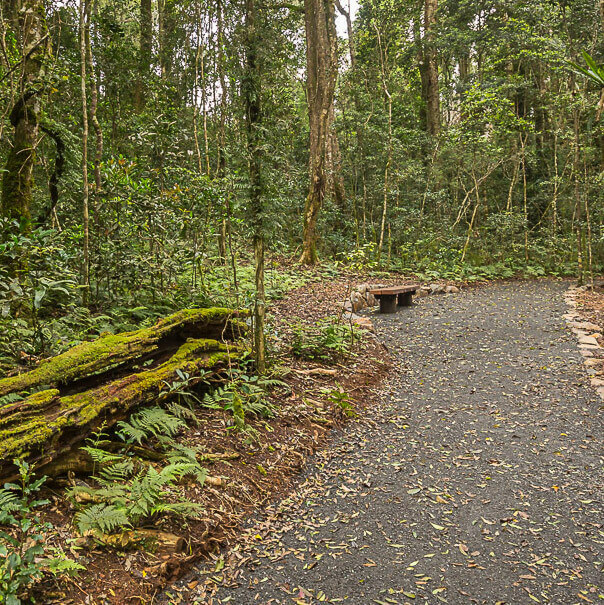 Visit the Queensland National Parks website for the latest information about the condition of walking tracks in Lamington Natonal Park. 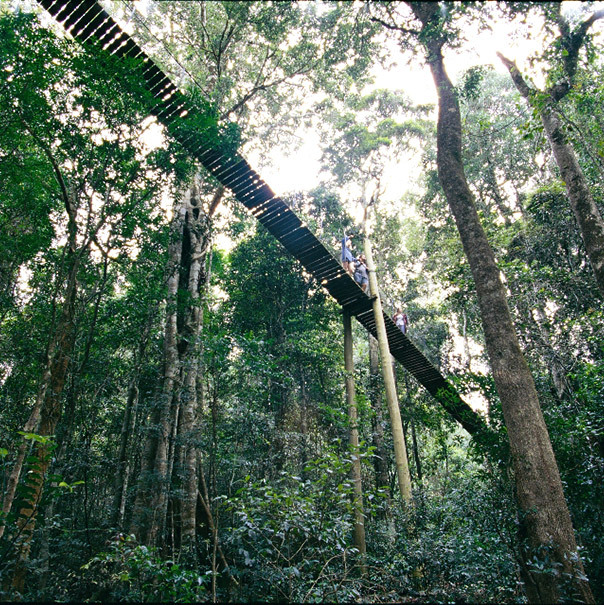 O’Reilly’s are celebrating thirty years since the completion of the world’s first Tree Top Walk. Watch the video and learn about the vision behind it and construction here. The Wishing Tree Track entrance is located below the main guesthouse accommodation. The track continues past some large Brush Box and over a tree fern gully spanned by a suspension bridge. At the Wishing Tree you can turn left into Glow Worm Gully or ahead under the Wishing Tree to Morans Creek. Retrace your steps for the easiest way home or you can extend your walk by following the track downstream to return by the Red Road (2.5 km) or Moran’s Falls (5km). Sharing the same entrance as the Wishing Tree Track in order to locate Mick’s Tower follow the track for 330 metres. Turn sharp right at the track junction for 120 metres. 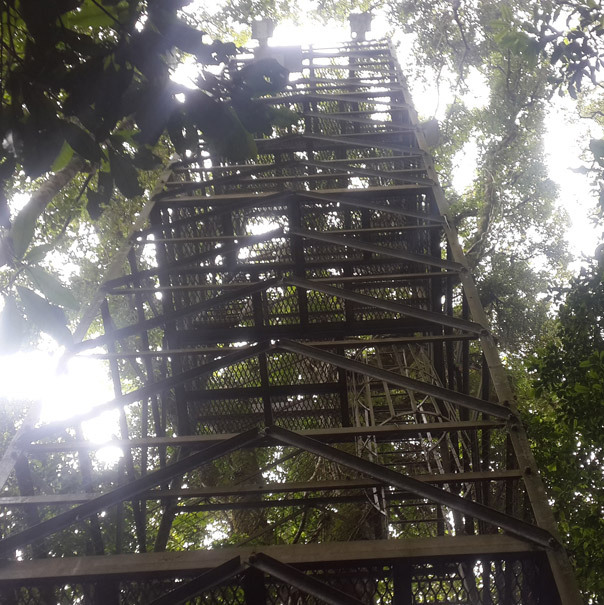 This rainforest observation tower is 18 metres high. Information signs on the various decks refer to the surrounding rainforest and in particular to a large Red Carabeen growing close by. This is an ideal spot to enjoy the tranquility of a rainforest canopy with the birds for company. This universal access track leaves from the northern end of the Green Mountains carpark, 150 m from the national park information centre. The track passes through tall hoop pine at the entrance and slowly descends through subtropical rainforest for 900 m to join the trailhead of the Python Rock and Morans Falls tracks. Bench seating spaced along the track offers excellent birdwatching opportunities. Watch for regent and satin bowerbirds darting through the branches, logrunners foraging on fallen tree trunks and Albert’s lyrebirds scratching in the leaf litter. 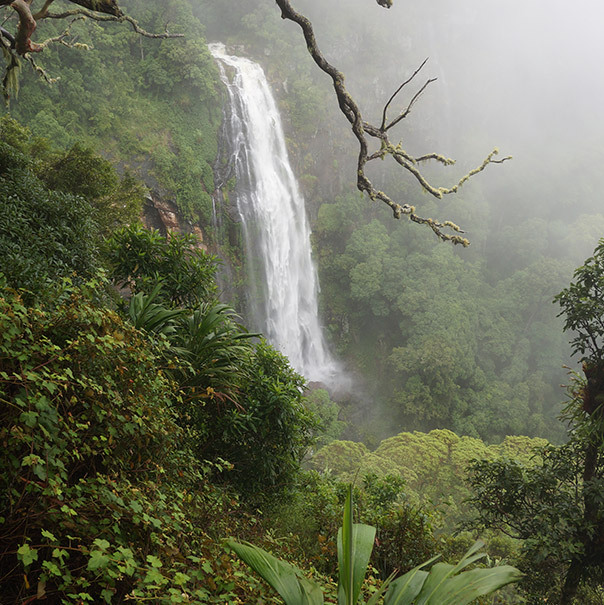 The track descends 140 metres through a sub-tropical rainforest of booyongs, figs and brush box to Morans Falls Lookout. A picnic area is located 400 metres further on at the top of the falls. This was the site of a bark hut, the first home of the O’Reilly brothers when they arrived on the mountain. Go through the entrance above the picnic area if you wish to return by the Red Road or to extend your walk – refer to the Moonlight Crag or Balancing Rock walks. The sealed track to Python Rock has even grades, suitable for older people and those confined to wheelchairs. The booyongs and figs near the West Cliff turn off are impressive as are the large New England Blackbutt as you enter the open forest for the first time. The view from Python Rock overlooks Castle Crag to the Lost World with Mount Throakban on the left and Moran’s Falls. You can proceed up the hill from the lookout on a tough track and turn left for West Cliff. These walks are not on graded tracks and involve some hill climbing. From the track entrance off the Red Road, follow the track downhill to the Red Cedar tree. then turn sharp right and cross the creek. At the next junction, take the left hand road (the track to the right leads to Moran’s Falls). Proceed up the hill from where the road turns sharp left and follow the power line to Balancing Rock. Keep to the road for Moonlight Crag and continue downhill for 150 metres from where the road ends for Moonlight Crag Lookout. Follow the track back down the hill and keep to the crest of the ridge for Balancing Rock. The Elabana Falls Track branches off the Main Border Track 1.7 km from the entrance. It descends through a stand of Antarctic Beech and then past the largest Brush Box trees in the National Park. Turn right at the Box Forest turn-off for Picnic Rock, a favourite lunch spot, but be sure to continue to Elabana Falls 400 metres further on. 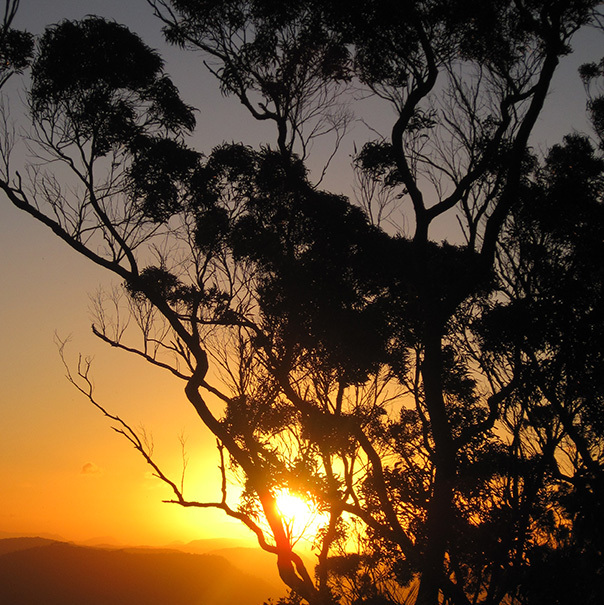 Pat’s Bluff affords a view over the Albert and Logan River valleys to the Great Dividing Range. Follow the cliff line down past a view of Raining Cliff to the picnic area. Pat O’Reilly’s log cabin is 70 metres in from this spot. Peregrine Falcons nest in caves in these cliffs and often rest in the dead trees above the cliff line. This circuit branches from the Border Track (3.2 km from the trailhead) and leads directly to Picnic Rock and Elabana Falls. It leads you through rainforest, past impressive stands of smooth, pink-barked brush box Lophostemon confertus, before reaching the falls. Similar brush box in other parts of the World Heritage area have been radiocarbon-dated at 1500 years, making these giants the oldest ever carbon-dated trees on Australia’s mainland. If you intend walking this entire circuit, walk in a clockwise direction and exit via Elabana Falls and Picnic Rock. The Main Border Track to Mount Bithongabel climbs 240 metres: observe the change from sub-tropical to temperate forest. The typical buttressed trees such as figs, Giant Stinging Trees and booyongs are gradually replaced by the small-leaved temperate species. Good examples of Antarctic Beech are growing in the area around Mount Bithongabel. The view from Bithongabel Lookout allows one to trace Bernard O’Reilly’s journey when searching for the lost Stinson in 1937, along the McPherson Range to the West as far as Mount Throakban. Continue past some large tree ferns on the left to Toolona Lookout where a view can be obtained of Mount Warning and Murwillumbah. The beech trees are a rewarding sight even if the view should be obscured by mist. Connecting the Binna Burra and Green Mountains sections of Lamington National Park, the track passes through warm and cool subtropical, and warm and cool temperate rainforest. The Border track is the backbone of this World Heritage-listed area and part of the longer Gold Coast Hinterland Great Walk. On a clear day, lookouts provide spectacular views and during winter months, you may hear the loud ringing call of the Albert’s lyrebird. O’Reilly’s provide regular bus transfers ($33 per adult) from O’Reilly’s to Binna Burra, so you walk the 21.4km track back to O’Reilly’s at your own pace (self-guided). Visit the National Parks website for track conditions and more information. Proceed to Picnic Rock and 200 metres further on, the Toolona Creek Track branches to the right, climbing 360 metres past waterfalls and sub-tropical rainforest trees decked with lush tree gardens. The track enters the Antarctic Beech forest near Wanungara Lookout – a favourite lunch spot – 100 metres to the left from the junction with the Main Border Track. Wanungara overlooks the Limpinwood Valley and Murwillumbah to the sea as far South as Byron Bay. Mount Warning is prominent on the right and a view to the left over the ranges gives one a glimpse of Point Lookout on Stradbroke Island. 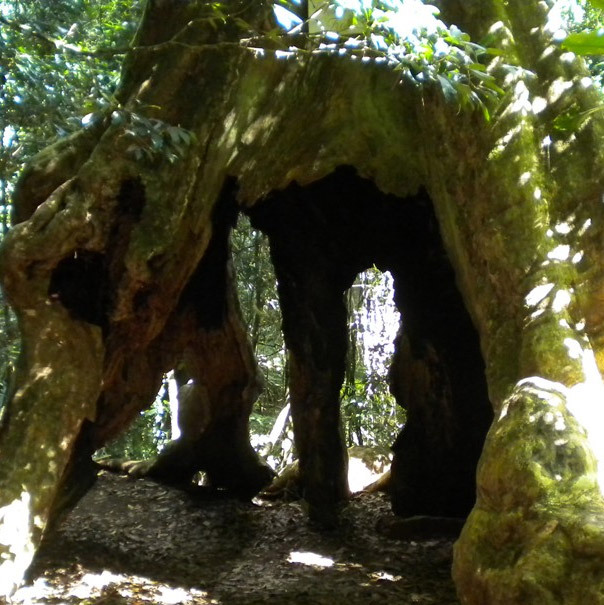 The 7.6 km trek home via Mount Bithongabel is mainly downhill and takes you past some lookouts and impressive old beech trees. This walk can be done anti-clockwise when the beauty of the tree gardens can be seen to better effect while walking down Toolona Creek. The Albert River Track branches to the right from the Main Border Track 4.5km from the entrance. Some good specimens of Antarctic Beech grow on top of the climb where the track branches to the right. The following long descent ends where Lightning Falls drop into Black Canyon. The track follows the Albert River up through temperate rainforest dominated by Coachwood with light coloured bark and the rough barked Antarctic Beech. This area is noted for its diversity of fern life. Across the valley on the right from Valley of Echoes Lookout, are Mount Wapawn and Mount Durigan. A feature of these border ranges is the growth of rainforest on the precipitous sides. Mount Warning is an old volcanic plug ending the reign of the giant Mount Warning Shield Volcano 23 million years ago. The remains of the rim still surround the crater (the Tweed Valley) on three sides and is visible from Mount Cominan Lookout. Behind, and to the right of Mount Warning, the Nightcap and Tweed Ranges can be seen forming the rim to the South and West joining the McPherson Range to the north. The track returns to Queensland and to O’Reilly’s via the Main Border Track. Lamington National Park Walking Track Maps are available from O’Reilly’s Mountain Gift Shop or O’Reilly’s Rainforest Retreat. These maps provide excellent guides to the walks of Lamington National Park. Looking for a challenge? Recount Australian history and celebrate the life of Bernard O’Reilly, who heroically saved the lives of two plane crash survivors over 80 years ago in World Heritage-listed Lamington National Park. 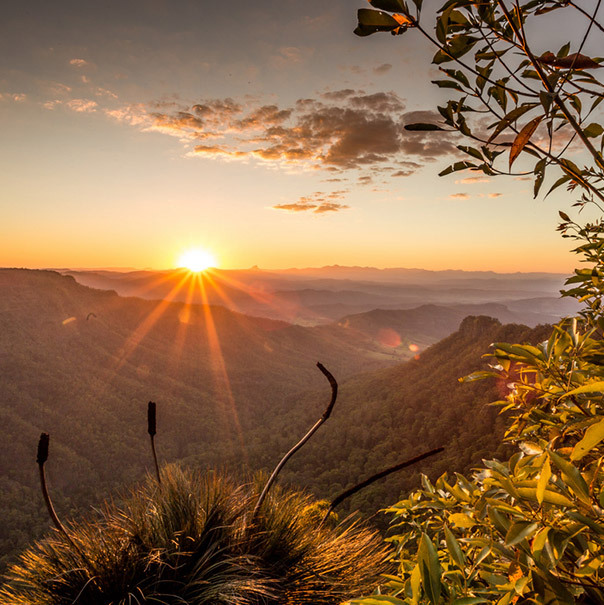 Following in Bernard’s footsteps, you’ll traverse 37 kms in one day from O’Reilly’s to the historic Stinson crash site through stunning landscape surrounded by the incredibly diverse and wonderful flora and fauna of Lamington National Park. Each year the O’Reilly’s team leads a small group of walkers on this iconic Australian hike. Register your interest for the next Stinson Walk here. Fitness requirements and conditions apply.